Those that attended the event in 2010 probably heard news of some big changes coming to Cincinnati for the 2011 tournament. As a tournament that's been growing since 1899, we're used to change. But we realize that our fans want to know exactly what to expect next year. The following cheat sheet is your guide to the changes in store for 2011. These three major tweaks represent more steps toward the Western & Southern Open becoming one of the largest and most fan-friendly tennis tournament in the world. Thanks for your support and we hope to see you in August. WHEN ARE THE QUARTERFINALS? FINALS? View a day-by-day match planner here. For the first time in the modern era, the men and women will play throughout the same week. In one trip to the Lindner Family Tennis Center fans will see stars from both the WTA and the ATP tours playing on courts right next to each other. 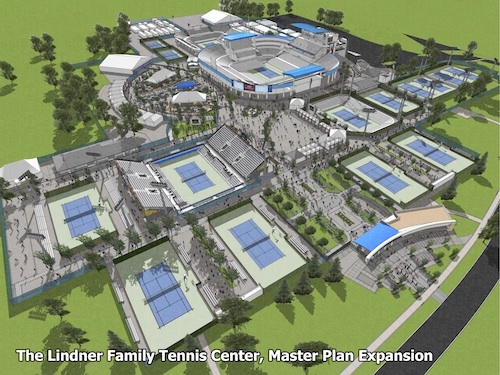 To accommodate the combined event, the Tennis Center will undergo a major grounds expansion that will include 6 new courts, main entrance, entry plaza and retail space. For more photos go here. The 2011 event will be played August 13-21, in a time frame just over one week. Compared to the 16-day event of 2010, this new format will pack more tennis into each day creating a more fan- friendly tournament for all.